Stephen Bauer leans over a piece of wood, rhythmically stabbing at it with a screwdriver. He feels a little guilty about the care that the builder of this cabinet put into making it look perfect. But a job is a job, and this cabinet needs to look old. Attractively so. “I refinish anything as long as it doesn’t breathe,” Bauer says. He trades the screwdriver for a flat piece of metal and begins chipping away at the edges of the cabinet door. Bauer, 58, never planned to become an expert in surfaces. Raised in Kentucky, he went to art school and trained as a printmaker. But to cover tuition, he worked as a house painter — a job that continued to pay the bills after he moved to San Francisco in the early ’80s. 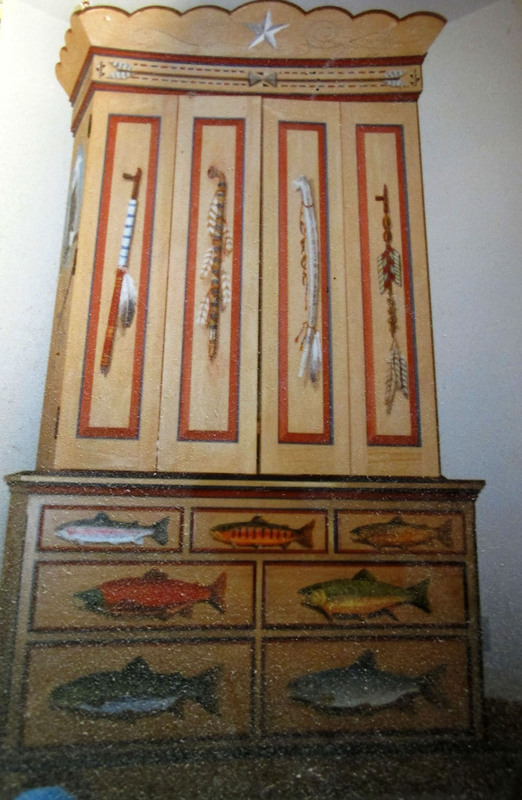 Painting walls got old fast, and when Alain Dufour, a wine seller-turned-cabinetmaker, asked him if he could lacquer a cabinet, Bauer jumped at the opportunity. Bauer, as it turned out, was good at this new line of work. For the next three decades he continued experimenting with how to apply varnish, lacquer, paint and stain to furniture. He learned what chemicals produce a certain weather-beaten quality or sheen. He never did much advertising, but just through word of mouth his business grew. Behind us is a backroom filled with mirrors, chairs and a huge wooden surfboard — all in need of different treatments. We’re sitting on two more works in progress — freshly sanded chairs. Bauer gets up and crouches down to show me a tiny postage-sized stain of darker brown on the bottom of a table that goes with the chairs. He needs to make the entire chair the color and texture of that postage stamp, and there the challenge lies. 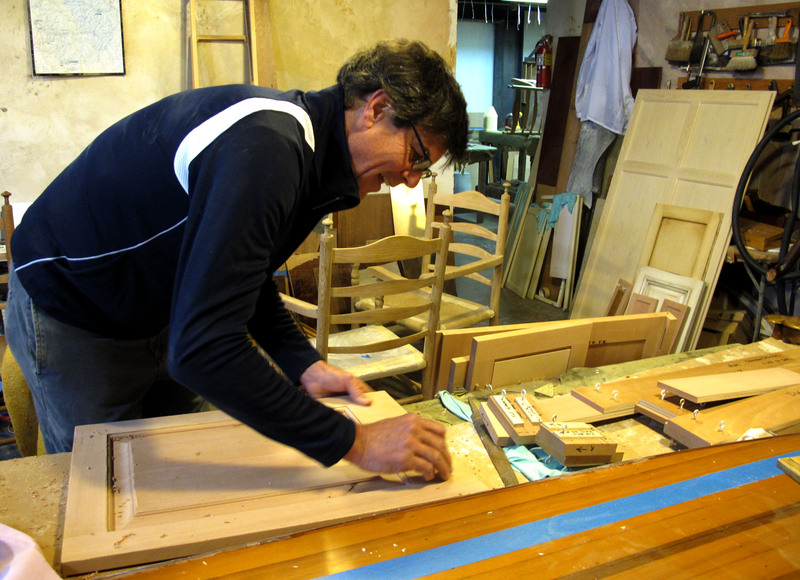 Bauer looks up as Duane, a furniture builder he has known since the ’90s, walks in with a few pieces of stained maple. Duane’s clients were not too happy with his colors. He’s looking for Bauer’s advice. The front of the workplace is bustling with activity — cabinets are being sanded and painted and the air is thick with chemicals and filled with the noise of giant fans. Billy Betford, 61 years old, dressed in a white suit and blue face mask, is spraying a bunk bed white. Betford has worked with Bauer for over a decade — he’s one of seven employees. The recession has hardly made a dent in the business. The group recently refinished the interior of Michael Mina, an upscale restaurant in downtown San Francisco. One of his employees, however, points out evidence of a creative life still in progress. Bauer’s son Asher is a 21-year-old film student, but he also works in the family business. He points to photos of his dad’s other work — photorealistic paintings of beetles and ladybugs, pinned to the wall in between postcards and pictures of Asher growing up. Bauer does occasionally paint on the job — just not the sort of painting he would do in his free time. Asher takes down another photograph, of a cabinet commissioned for what Asher describes as an “over the top” Western cabin. 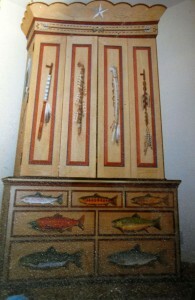 Bauer's meticulously painted cabinet commissioned for the Western-themed cabin at Lake Tahoe.